Russian carrier UVT Aero, which is based in the Republic of Tatarstan, is planning to start a fleet renewal effort early next year. The first phase will see the airline receive three aircraft aged not older that eight years, CEO Petr Trubaev told Business Online publication. Trubaev said no decision has yet been made on the aircraft’s type. The airline is considering narrowbodies such as the Embraer E190/E195, Airbus A319, and Boeing 737-700. It is also studying the possibility of taking Russian-built Sukhoi Superjet 100 (SSJ100) regional jetliners, whose operators enjoy preferences provided by the Russian government. The SSJ100 option started looking even more appealing after Tatarstan-based MRO provider Tulpar Technic was approved to provide maintenance of these aircraft. The decision on which type UVT Aero shall choose is expected to be made on the highest possible level, up to the government of Tatarstan. The aircraft are to enter service in the first quarter of 2018, so that the airline could have increased capacities by the beginning of the summer season. To save costs, the new aircraft will only be sporting the airline’s logo and name initially. They will be repainted in the carrier’s livery later on. UVT Aero is also negotiating with two soccer clubs over the possibility of painting its aircraft in their team colors. The airline also has two helicopters, a Bell 429 and a Robinson R66, and has “certain plans regarding the oil sector,” Trubaev revealed. 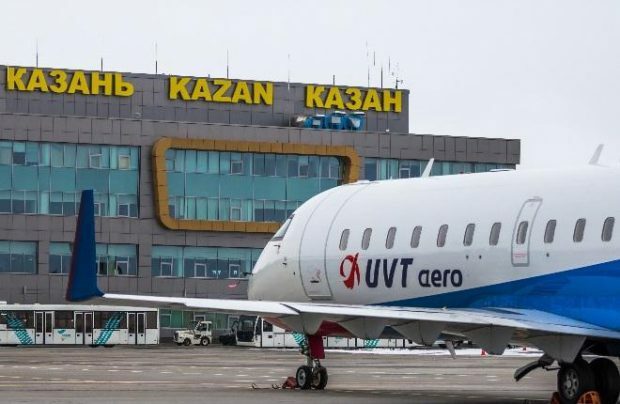 UVT Aero is based at Kazan, Bugulma, and Begishevo. It has a maintenance base at each of these airports; the main facility, located at Kazan, It performs most maintenance operations in-house except for overhauls. “We have all the approvals, and have purchased all the necessary equipment. We can also provide maintenance on two latest types: the Kazan Helicopters Ansat rotorcraft and the Dassault Falcon 8X business jet,” Trubaev stressed. The airline launched operations two years ago. In 2015 it reported a loss of 121.6 million rubles ($2 million at the current exchange rate). One year later, thanks to the cost optimization measures, particpation in the government subsidies program, and fleet expansion, it registered a profit of 321.7 million rubles. The management estimates the 2017 profit to reach 118.9 million rubles, despite the fact that the carrier has launched a costly scheduled engine repair program. UVT-Aero ranks 30th on the list of Russia’s largest airlines by passenger traffic. In the first half of 2017 it carried almost 102,000 passengers, up 27.4% on the same period last year. Its seat load factor increased 1 p.p. to 71.7%.